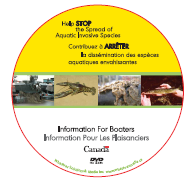 This informative DVD provides information on Aquatic Invasive Species for recreational boaters. This educational video contains both a youth version and an adult version. 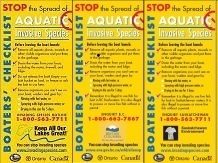 These waterproof stickers help to remind boaters how to protect the environment from Aquatic Invasive Species. Province specific stickers are available for Ontario, British Columbia, Saskatchewan, Manitoba, and Nova Scotia. 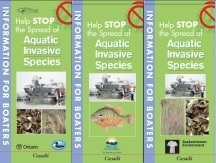 These brochures describe the problem of Aquatic Invasive Species and explain how boaters can be part of the solution. Province specific brochures are available for Ontario, British Columbia, Saskatchewan, Manitoba, and Nova Scotia.